All of our main posts will be submitted at ProLifeUnity.com from now on. The feed below is pulled from that site. 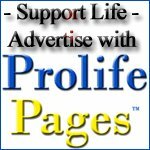 To keep up to date and to get involved with Pro-Life efforts, go to ProLifeUnity.com. Our efforts in the movement have to increase, not slow down. Our voices must get louder with time, not quieter or tired. Galatians 16:9 "Let us not become weary in doing good, for at the proper time we will reap a harvest if we do not give up"
It's the first Friday of the month and it's time to call for LIFE! Thank you for all you do for the unborn. Without us speaking out for them, they would die in silence. In the end, our representatives, through our prodding, will do the right thing and end abortion. There is plenty going on in the Pro-Life world right now. Of course the Call for Life is today, on Sunday is the Life Chain at http://LifeChain.net and Pro-Life Memorial Day is on Monday. I will be speaking at the Supreme Court with other Pro-Life groups, joining with American Life League for this event. Then we have the National Day of Silent Solidarity at http://silentday.org on October 21st. Over 2500schools will be participating this year! Go to ProLifeUnity.com & click on the Calendar at the top to see what all is going on. What have we been doing since the last Call for Life? The Pro-Life Legislative Action Team Forum (PLATForum) is official! Johanna Dasteel, Senior Congressional Liaison for American Life League and I are working together to help represent Pro-Life on the hill. The time has come for Pro-Life people and organizations to have a 100% Pro-Life voice, one which not only provides education on research and ethical issues to our representatives, but also to help us understand what is being voted on, and give us a chance to let them know where we stand on these issues when they are proposed. Last week, Dr. David Prentice from the Family Research Council spoke about ethical research at the FRC, where the opening was held. The videos for event that are going up over the next few days, but you can see his short talk and some interviews on the site now. We will build a separate site for the PLATForum soon, but until then, you can see our articles and videos at ProLifeUnity.com. Speaking of videos, I'd like for y'all to welcome Michael, our new cameraman and producer. He has been incredible, posting videos on our sites faster than I can write the supporting articles for them! They are being uploaded at 3 sites right now, so if you don't want to wait for supporting articles to hit the site, you can always go to http://eyeblast.org for medium-quality, YouTube for low & medium-quality & Vimeo.com for high-quality and HD video. EyeBlast has a great bunch of more conservative videos, & again, with decent quality. We are honored that they added us as a Channel, available from the pulldown at the top-right. After that event, Johanna and I rushed over to the congressional Cannon terrace. The event was the introduction of the Prenatal Nondiscrimination bill, sponsored by Congressman Trent Franks. Present were Dr. Alveda King, Dr. Johnny Hunter, Day Gardner and many more. We interviewed them and others, and those videos will be going up in the next week. Then it was on to the 40 Days for Life Kickoff Rally at Lafayette Park, right across the street from the White House. About a hundred people gathered for speeches, followed by a procession to the 16th Street abortion mill. Yep, more videos to follow from that event as well. If you haven't signed up for a 40 Days for Life shift at an abortion mill, go to 40DaysForLife.com and do so. Hundreds of thousands of us are doing our part to take part in 24 hour prayer vigils. I guarantee that hundreds of people will be saved from death by abortion because of our efforts! Why do we call and/or email for life? Will it really make a difference? Look at it this way, if we do nothing, we will get nothing. If we don't let our representatives know what we think, they will do whatever they want. We can't just push the button at the voting booth & walk away. That's all for now. Pick up your phones & warm up your keyboards, because it's time to Call for Life. Do you believe we can end abortion? I do! In this video, Pastor Caesar Lafleur is sending a Pro-Life mesaage to Pastor's around the world, encouraging them to get involved with anti-abortion / Pro-Life issues, and to speak the truth to their congregations. I interviewed Joe Healy, Associate Director for DefendLife.org, yesterday. He was on the road with the Defend Life Face the Truth tour when eighteen people were rounded up like common criminals and thrown in jail, all for standing on the side of the road with signs. Imagine, there you are, standing quietly on the side of the road, holding a sign, and suddenly, like communist China, police pull up, put everyone in handcuffs and haul you off, no formal charges and no reason given. Do you have the answer to this question? Click here to vote at ProLifeUnity.com. Nick Cannon's Video "Can I Live"